This is one of the last productions in the UFA style at the beginning of the 30s, originally planned as an Erich Pommer production. The productions values are still here, but Pommer had already left for the U.S.A. The sets are fabulous, the dialogue is great (and very funny) and the cast is outstanding (note e.g. Willi Fritsch, showing that he can do more than just smile; and Adele Sandrock). This is Schuenzel's masterpiece: his direction is elegance itself. [Of course Schunzel is also know for the very fine VIKTOR UND VIKTORIA, source for VICTOR/VICTORIA by Blake Edwards.] Many sources claim that contemporary German audience recognized the - concealed - Goering parody and other references to the present situation. 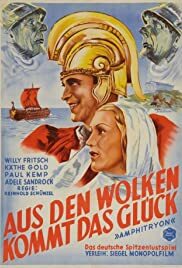 After some hesitation the showing of the film was allowed by the ProMi (=Goebbels): it also recognized the Goering parody. The film became a great success. This film should be an international classic; and Schunzel a more known director.